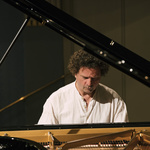 BIS Records is delighted to announce the start of an important new collaboration with the renowned pianist Andreas Haefliger, an artist about whom the Washington Post has written "Each keystroke is a poetic act". Planned for release in Spring 2018, the first disc to come out of the collaboration will be ‘Perspectives 7’, the latest in Haefliger’s series of very personal programme constellations that each take a Beethoven sonata as their point of departure. This particular programme juxtaposes Beethoven’s Piano Sonata No.28, Op.101 with works by Berg, Liszt and Mussorgsky. Future recording plans with BIS will include the continuation of the Perspectives series, solo recital discs of other repertoire and concerto recordings. Visit Andreas Haefliger’s new website for further information. You can also watch a video clip from the recording of the Berg Sonata. We are excited to announce a new collaboration with the internationally aspiring Norwegian violinist Eldbjørg Hemsing, to result in the release of four SACDs by 2020. The first disc, her recording debut, is to be released in early 2018, featuring concertos by Hjalmar Borgström and Shostakovich with the acclaimed Vienna Symphony Orchestra under Olari Elts. Later the same year, a second disc will be released, with Dvořák’s Violin Concerto and Suk’s Fantasy for Violin and Orchestra. 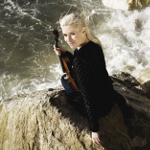 Eldbjørg Hemsing made her solo debut with the Bergen Philharmonic Orchestra at the age of 11 and has since been invited to perform with prestigious ensembles, such as MDR Radio Symphony Orchestra Leipzig, Netherlands Symphony Orchestra and the Oslo Philharmonic. She is the first recipient of the newly-established Göhde Foundation music scholarship, focusing on supporting gifted young musicians. The full press release can be found here. 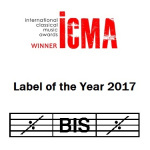 BIS is Label of the Year! The Jury of the International Classical Music Awards (ICMA) has announced the winners for 2017, and we are proud to have been chosen Label of the Year, by this group of professional music critics from 16 major magazines, online services and radio stations across Europe. The award ceremony will take place on the 1st April in Leipzig, Germany, in connection with a gala concert hosted by the Gewandhausorchester. Read more about the ICMA, and the other prize winners here. The BBC Music Magazine Awards are among the most prestigious of classical awards, and we are happy that no less than two BIS releases are among the 21 discs shortlisted for the 2017 edition of the event. The magazine’s reviewers select three albums in seven different categories from those discs that have received top reviews during 2016, and now it is for the public to vote for their favourites. The two BIS titles shortlisted for the awards are Sibelius Symphonies Nos 3, 6 & 7 from Minnesota Orchestra conducted by Osmo Vänskä (BIS-2006; Orchestral Award) and Mendelssohn String Quartets Nos 5 & 6 recorded by the Escher String Quartet (BIS-1960; Chamber Award). Find out what other discs have been nominated, and cast your vote here. British composer Sally Beamish turns sixty today, and as her music appears on no less than nine BIS releases we naturally want to congratulate her. Her rich and varied production includes concertos, chamber music and orchestral works and is championed by musicians and ensembles such as Håkan Hardenberger, Branford Marsalis, Tabea Zimmermann, Sharon Bezaly, Swedish Chamber Orchestra and Royal Scottish National Orchestra. 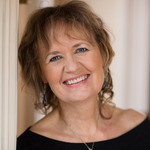 Not one to rest on her laurels, Sally Beamish is unceasingly productive and a number of new works are being premiered this autumn – read more about them on the website of her publisher Norsk Musikforlag. 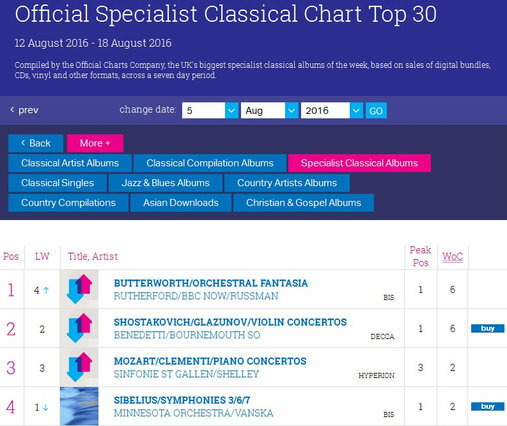 BIS releases have held top positions on the UK Specialist Classical Chart. Two BIS discs have vied for No. 1, with the final disc in Osmo Vänskä’s Sibelius cycle with Minnesota Orchestra (BIS-2006) today backing down for ‘Orchestral Fantasia’ (BIS-2195), commemorating George Butterworth and celebrating his orchestral music. Just released, Vänskä’s recording of Symphonies Nos 3,6 and 7 has met with high praise, for instance in The Sunday Times (UK): ‘With these recordings, Vanska confirms his status as our greatest living Sibelian. Irreplaceable.’ Meanwhile, appearing shortly before the 100th anniversary of the composer’s death during the battle of the Somme, the disc with Butterworth’s orchestral music has struck a note with many listeners.